1967년 서울시 도봉구 삼양동에서 발견된 높이 20.7㎝의 보살상으로, 현재는 국립중앙박물관에서 관리하고 있다. 발목 윗부분에 금이 가고 왼쪽 옷자락이 약간 떨어져 나간 상태이다. 머리에는 삼각형의 관(冠)을 쓰고 있고, 양감 있는 얼굴은 원만해 보이며, 입가에는 엷은 미소를 짓고 있다. 상체는 어깨가 좁아 위축된 모양이며, 배를 앞으로 내밀고 있어 옆에서 보면 활처럼 휘어진 모습이다. 배와 무릎 근처에 이중으로 걸쳐져 있는 두꺼운 옷은 U자형으로 늘어져 있다. 치마는 두껍게 입어서 다리의 윤곽이 뚜렷하지 않으며, 옷주름은 몇 가닥의 선으로 단순화시켰다. 오른손은 허리 근처에서 정병(淨甁)을 들고 있으며, 왼손은 위로 올려 엄지와 검지를 V자형으로 곧게 펴고 있는 특이한 모습이다. 보살이 서 있는 대좌(臺座)에는 엎어 놓은 연꽃무늬를 새겨 놓았으며, 꽃잎은 그 끝이 뾰족하여 보살상의 부드러움과 대비된다. 이 보살상은 삼각형 모양의 관에 작은 부처 하나를 새기고 있는 점과 오른손에 정병을 들고 있는 점으로 볼 때 관음보살이 분명하며, 살찐 얼굴과 신체, U자형으로 늘어진 옷 등으로 보아 만든 시기는 7세기 전반으로 추정된다. 따라서 삼국시대 후기에 크게 유행했던 관음신앙의 단면을 보여주는 귀중한 자료라 하겠다. 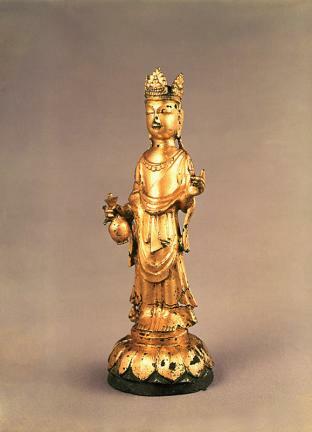 The statue (height: 20.7cm) was found in Samyang-dong, Dobong-gu, Seoul in 1967. At present, it is kept at the National Museum of Korea. It shows a crack on the upper part of the ankle, with a small part of the leftmost side of the robe torn off. It wears a crown with three pyramid-shaped figures set up at the side. It has a plump face wearing a gentle smile, including narrow shoulders as well as a protruding belly. A double layer of robe covering the belly and the lap hangs like the letter “U.” The legs are covered by the thick robe. Robe wrinkles are expressed simply with a few lines. The right hand holds a kundika bottle. The left hand is held upward, with the thumb and the forefinger extended outward, positioned like the letter “V.” The pedestal on which the statue stands is carved with lotus flower patterns facing upside down. The sharp ends of the lotus flower patterns are in stark contrast with the overall soft appearance of the statue. The shape of a Buddha inscribed on the pyramid-shaped figures attached to the crown and the kundika bottle held on the right hand show that it is an Avalokitesvara Bodhisattva image. The statue was presumed to have been made in the early 7th Century based on the plump body and the U-shaped robe wrinkles. It is a precious material associated with the Avalokitesvara faith prevalent in the late Three-Kingdoms Period (circa 57BC-668 AD).